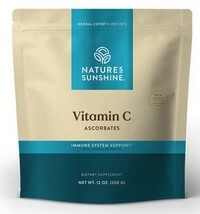 From Nature's Sunshine - NSP - Supports bone health. Helps maintain the immune system, especially during the cloudy months. From NSP - Nature's Sunshine - Iron from organic sources, very high in phosphorus manganese, which works with iron to get oxygen to the cells of the body. Provides 100% or more of the Daily Value for 11 essential vitamins. Offers significant amounts of 10 important minerals. Vitamin E and selenium should be taken together (in most cases) because they are co-dependent in the body. They are both antioxidants. Non-acidic powder is easy on the stomach.This unsweetened vitamin C powder can be mixed with water or fruit juice.